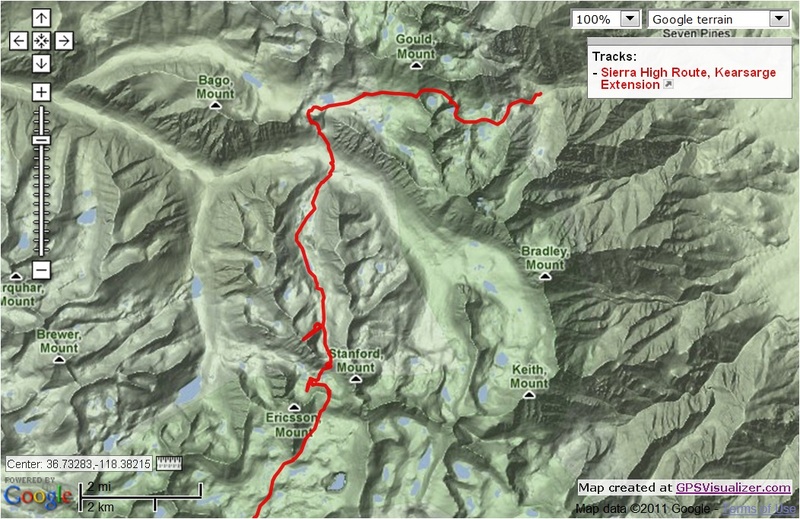 Sierra High Route – Days 1 and 2 | Meghan Kelly Teles! 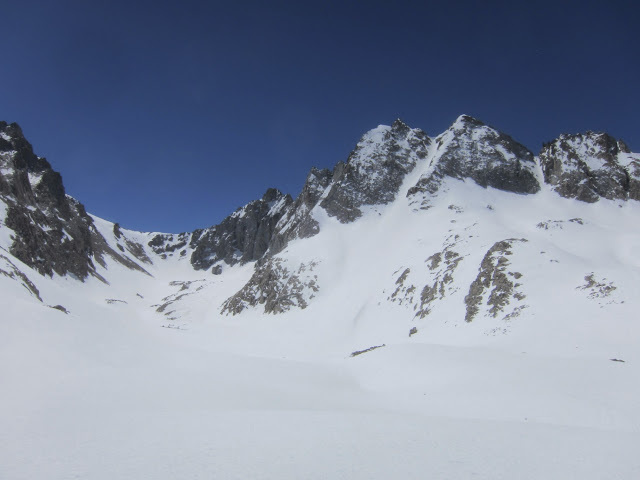 When a super reliable and experienced ski partner of mine told me he was planning on doing the Sierra High Route, I rearranged my schedule and blocked out the first week of May in hopes that the weather would cooperate. 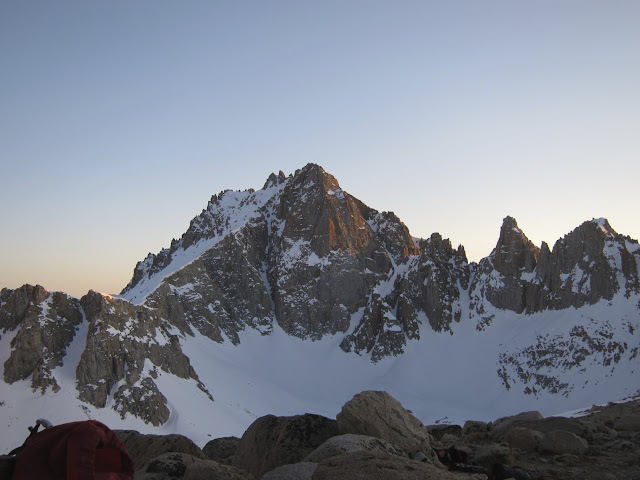 As the departure date became closer, it was looking more and more probable and we started planning things like lightweight tents, food and car shuttles. Turns out my ski partners David and James – two phenomenal splitboarders actually, had all that stuff dialed and I basically had to show up. Add to that the first stable week-long forecast in the Sierras since January and we were all set. How lucky was I? The plan was to start from Kearsarge Pass – which is different from the traditional Shepard Pass start, but allowed us a few advantages. First off, we got to skin from the car. Here we are all smiles and ready to disguise ourselves from the sun. The second advantage was that the route took us by Deerhorn Mountain which has a super cool couloir that we were all interested in skiing. The third advantage that we didn’t anticipate, but was pretty nice, was that we didn’t see other people for 3 days! The Sierra sun is super intense in May so we came up with some crazy disguises. James kind of looks like a Taliban fighter… this is the same day US Forces killed Osama Bin Laden, but we didn’t know about that until much later in the trip (photo credit: David). 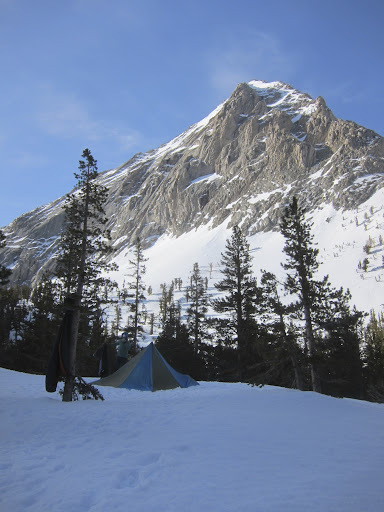 We skied a few runs and set up camp in Vidette Meadow. David had scored a Black Diamond Mega Light tent and we had fun figuring out the best way to set that up every night. This was our worst tent job, but a cool background (photo credit: David). View from the top and somewhat towards the rest of our route (near that flat mountain aptly named Table Mtn). We were hoping to ski some corn on the way down, but a light wind and the high elevation kept the sun-exposed snow really hard. So we stayed in the sun-protected snow and found some decent wind affected powder. I did a little helmet camming, but the mount was not right so I’ll save you the time. The run was steep and the snow was pretty variable, but it was a long, aesthetic, and exhilarating run. After skiing Deerhorn, we returned to the stuff we had stashed to make our packs lighter and donned our heavy packs again to continue on our route. 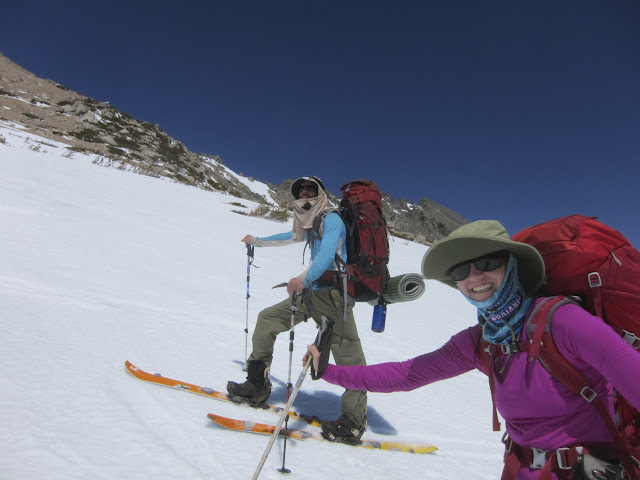 The full weight of the pack was not welcome after booting up a 2,000 ft couloir and so when we crested the next pass and saw how steep the next one looked, we decided to make camp on the pass and treat ourselves to late sun and stellar views. Mt. Ericsson looking pretty (photo credit: David). Here is a GPS track from Days 1 and 2 of our trip. Stay tuned for days 3 -6.